Pictures are taken from Facebook photos. Bike checked in was on Saturday and the bikes are stored inside a big hanger. These will also going to be the transition area. The bikes staying overnight inside the hanger without having to worry about raining or the morning dew and fully secured. Memang bagussss !!!!! All bikes types are accepted for this competition. TT bike, road bike, MTB and even a few FIXIE’s. During the number collections, I saw the list of participants in my categories and from the look of it, the chances of me getting top 5 is very high. Most of the superheroes are not attending, so good for us lah. The only superheroes attending is Ahmad Fathi. So still 4 places to grab. The Sunday race will start with a sea swim at 6:20am and the first group that will go will be the individual RBAF personnel and civilians. Most of us the public reached at the venue very late. I woke up at 5am and reached at the venue around 5:50am and have to parked far away. I think Sofian Thani arrived 6am and Ahmad Fathi arrived 10 minutes before the flag off. I passed by the transition area for the cyclists and runners of team relay. Ali of Team Anakpanyu was one of the cyclist and he told me I was no 2 out of the water in my categories. Yeaaaaaa, I was happy and excited. So far so good. I went to my bike and saw that Ahmad Fathi’s bike was already gone. I saw Ahmad Fathi outside the Serasa beach road and I guessed I was behind 2 minutes. After the U-turn at Serasa beach road, I saw Hamsul on the other side and he was, I guess 1.5 minutes behind me. I was escorted by the Policeman all the way for 40km and I don’t have to worry about any crazy motorists hitting me. Ahmad Fathi was also escorted. This was the first time in any event I was escorted all the way. Siok kali aahhhh !!! During the 40km bike, only 1 person managed to take over me. 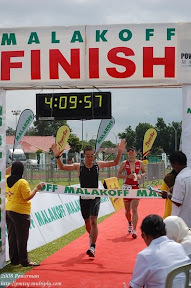 It was Moza and luckily he was in the RBAF Individual category. We stayed together for a while taking the lead and helping the other person to draft. Before the U-turn point at Vocational school, I’ve decided to let him go as he was too fast and I need to recover. I took 1 Powerbar Gel to top up my energy. I saw Ahmad Fathi was already on the other side of the road and to my surprise I saw another cyclists with his number range the same as our categories. So I’m not number 2 but no 3. That means I have to beat 2 person to get to number 1. I managed to catch the boy and looked at him briefly. He is/was the Brunei National swimmer. No wonder he was fast in his swimming but from the look of it, he was already tired in his cycling. I didn’t managed to catch Ahmad Fathi probably because its either I was too slow, he was too fast or both our speed was almost the same. Reached the T2 area at a time of 1:08:00 and I still considered it good timing. I saw Ahmad Fathi was already running and I guess he was leading 4 minutes. I know my chances of winning are already gone. Ahmad Fathi is a very strong fast runner. So my target right now is to maintain my position in 2nd place. Outside the Serasa beach road before heading to Serasa housing scheme, I saw Hamsul in 3rd place and followed by Sofian and Zaeidi. I know Zaeidi is also a strong runner, so I have to maintain my pace and not to stop running. I guessed around 5 to 7 runners overtook me but all in the different categories. So nothing to worry but I keep on looking behind if Zaeidi is within the distance. I crossed the finish line in 56:30 minutes and 4 minutes after that Zaeidi. Ahmad Fathi crossed the finish line in overall time of 2 hours 29 minutes, 17 minutes leading to take the number 1 title. From 4 minutes leads in the cycling, it becomes to 17 minutes in the run. He said his run was around 45 minutes. Overall, I’m happy with all my swimming, cycling and running. I had to stop swimming for 2 weeks due to eye conjunctivitis and only have 2 weeks to train. I only did 2 times a week of cycling and my running, I didn’t have much time on it. Brick training, I only did it 1 time and it was 3 days before the event. 10km bike with 1km run. Overall this was one of the great race this year. Getting 2nd place and all the 5 winners are friends. It feels good and very very happy. Remember this: “ In TRIATHLON, You crossed the finish line not by swimming or cycling but by running to the finishing line” – anonymous.